IN MANY Western countries, including America and Britain, divorce lawyers are not allowed to represent a client in exchange for a share of whatever settlement they secure (as opposed to charging a fixed fee). Such arrangements, it is feared, would beget more and nastier divorces. Yet the same rules do not apply to financiers: they are free to fund legal battles over marital assets—and a growing number do. Novitas Loans, a British firm, is currently lending to 1,500 would-be divorcées (most are women) or divorcés, at 18% annual interest. The loans are intended to cover legal fees; applicants typically expect to win assets worth three times their borrowing. Without the loans, many would have to give up and settle for much less, says Jason Reeve, the firm’s managing director. It gets lots of thank-you letters from borrowers, he claims. Demand for loans of this kind has jumped since the British government restricted legal aid for divorces in 2013, notes Nigel Shepherd of Resolution, an association of family lawyers. Brendan Lyle of BBL Churchill Group, an American firm with cases in 27 states, says his role is “part financier and part therapist”. Vengeful clients, determined to fight over every last teaspoon, must be restrained. The firm’s average loan is $306,000 in New York state and somewhat less elsewhere. The typical interest rate is around 16%. The default rate is a modest 2%, although there is some forbearance for struggling customers. 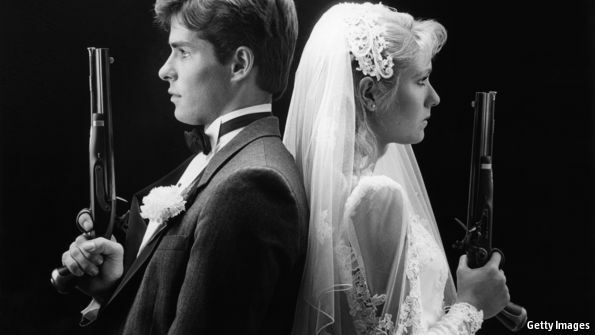 The big risk for divorce funders is that a couple might get back together. When that happens, assets are not sold and a borrower may not be able to pay back the lender. Novitas therefore prefers to fund cases that have been grinding through court long enough to make reconciliation unlikely. The Iceberg Partnership, Novitas’s biggest competitor in Britain, transfers this risk to the 374 law firms that refer clients for funding. They must agree to guarantee their clients’ loans, repaying Iceberg themselves if the client defaults. Rather than lend money, some firms “invest” in divorce cases, asking for repayment only if a settlement is reached. A year ago Novitas bought an American firm, National Divorce Capital, that offers such “non-recourse cash advances”. Since then, applications for advances have doubled. It plans to open branches in Australia and Canada later this year.